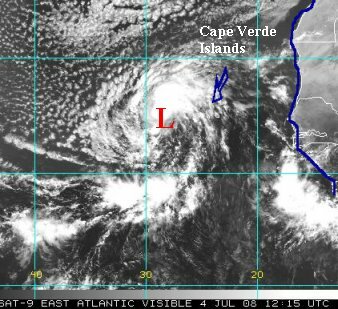 It looks as though the next tropical depression has formed off of the coast of Africa. 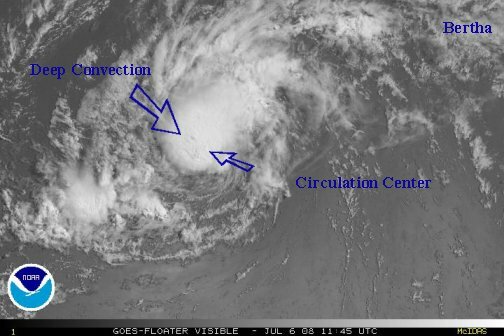 Deep convection as well as favorable outflow aloft are noticed on the satellite imagery. 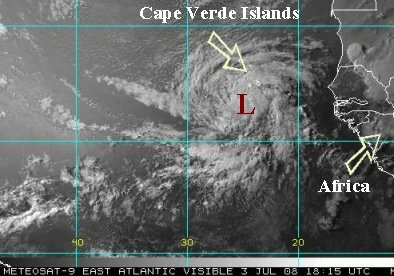 This one has a good chance of being the next named system and will likely move out into the open Atlantic Ocean. Last edited by Caribbean Traveler on Thu Jul 03, 2008 4:01 pm, edited 1 time in total. Satellite imagery looks nearly the same as last night. 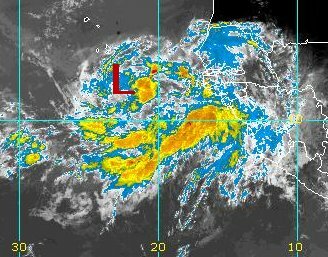 The system looks to be right near tropical depression stage. Forecast models develop it and move it into the open waters of the central Atlantic. Still little change with the satellite imagery. We still think this is a depression. 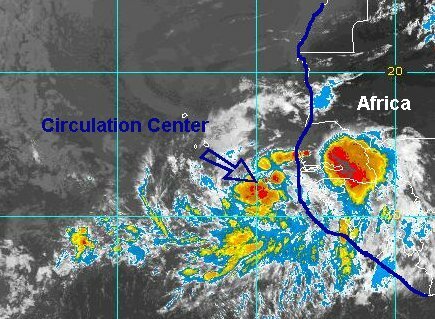 Quickscat has a well defined circulation a couple hundred miles west of the African coast and and several 30-40 knot wind estimates on the west side of the circulation. NHC usually will not call a disturbance a depression this far west unless it is bordering on storm strength. With the possible demise of this low in a few days, it may never be called a depression unless is develops more. Satellite imagery is still showing deep convection near the center, but limited. Quickscat also is still showing a closed circulation with some wind measurements in the 30-40 knot range. As mentioned before this should be a depression. Bertha was upgraded up to a tropical storm today. The microwave estimates, I think did the trick. 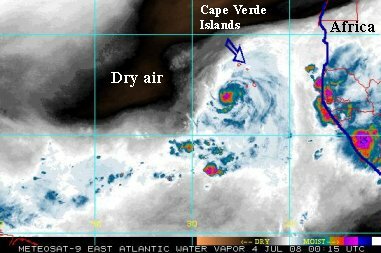 Squally weather is moving through the Cape Verde Islands at this time. Outflow looks favorable for continued strengthening and some models bring it to hurricane status as it curves north before the Lesser Antillies. Bertha is slowly getting better organized. Currently NHC has it at 45 mph which looks fine. Models gradually pull it into the middle of the north Atlantic ahead of the next upper trough. If it continues to strengthen, it should follow that track. If it weakens, the more dominant low level flow will carry it farther west. Bertha has stopped its organization for the present time. Deep convection is primarily on the north side of the circulation. The forecast models still take this tropical storm toward the central north Atlantic, but its still possible if it weakens could go farther west. Interests in Bermuda should keep an eye on Bertha, although its unlikely at this point to have an appreciable impact. Bertha is still has a top wind of 50 mph per NHC. This looks reasonable with the latest microwave satellite estimates. Bertha is centered about 2000 miles east of San Juan, 2100 miles southeast of Bermuda and 2700 miles east-southeast of Nassau. It appears that the convection is getting slowly better organized again. There is a chance that Bertha will become a hurricane. The forecast track takes Bertha west, then west-northwest several days down the road. Forecast models turn Bertha north of the Leewards. Residents in Bermuda should follow the progress of Bertha. The eastern and central Caribbean Islands as well as the Bahamas and Turks and Caicos may see increasing swell by early to mid next week, especailly if Bertha actually does become a hurricane. Bertha will probably be made just a bit stronger on next update. It looks like the convection has increased just a bit. Forecast guidance shows Bertha turning in about 3-4 days in the general vicinity of Bermuda. All interests in Bermuda should watch Bertha for the middle of next week. Bertha has changed little in intensity overnight. The top winds are still officially 50 mph. Currently it is centered 1650 miles southeast of Bermuda, 1450 miles east of San Juan, and 1900 miles east-southeast of Nassau. Deep convection is bursting again, especially on the western and northern part of the circulation. Some cloud tops have cooled to -60 C This may translate to some strengthening. 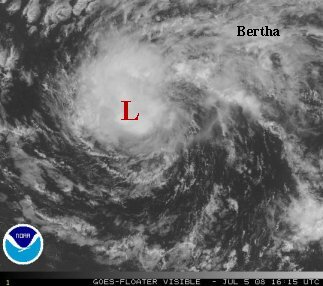 Many times it is hard for a tropical cyclone in the formation stages to strengthen when it is moving over 20 mph + like Bertha is. Bertha will also have a chance for strengthening not only as it slows down, but also as it moves over warmer water. Right now it is over 26 C water, a little cool. Forecast models mostly recurve Bertha toward Bermuda in several days. A few of the models nearly stall Bertha several hundred miles east of the Bahamas before resuming the northwest track. Since the forecast models usually can't pick the details that well that far ahead in a situation like this, it would be foolish to make a call to say recurving toward Bermuda for sure. The "other" Bertha, in 1996 has drawn many comparisons. That Bertha formed at around 9 N. This Bertha formed considerably farther north. It would be an incredible feat for this Bertha to reach the U.S. east coast starting at such a high latitude. The odds are well against it. 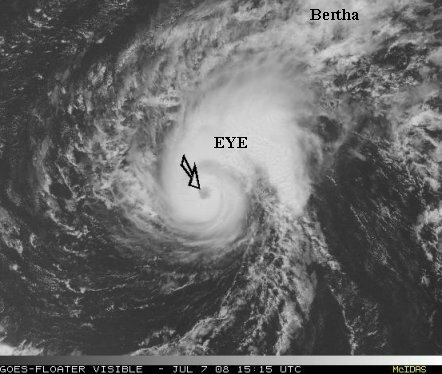 Bertha was bumped up to 60 mph by NHC per a slightly better appearance on the satellite. A more in depth analysis will be posted later this evening after the next model runs. 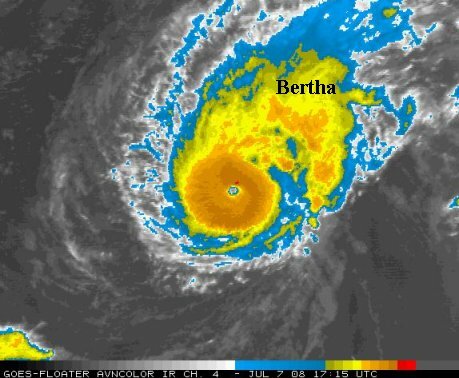 Bertha is becoming a hurricane. NHC has brought the top winds up to 65 mph and is projected to become a hurricane by 8 pm tomorrow. An eye wall is forming as seen on the satellite picture. We believe that the top winds may be 65-70 mph. Bertha could become a hurricane by tomorrow morning if the strengthening trend continues. This is actually good news (except for Bermuda). 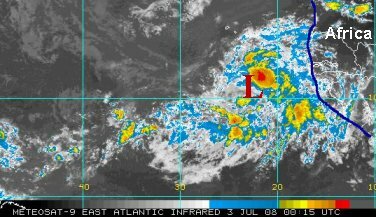 With Bertha becoming stronger, it is more likely to be picked up by the upper trough in a few days and send it away from the Caribbean, the Bahamas, and eastern U.S.. Most of the models are turning Bertha northward in the general vicinity of Bermuda by later in the week. 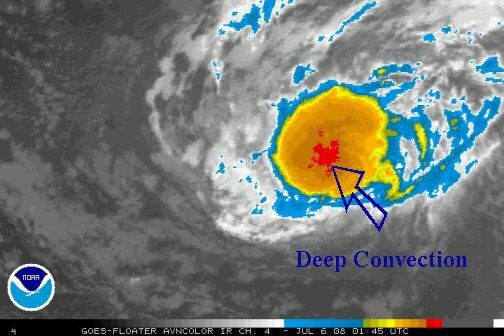 It is still too far in advance to make a call of how close or how strong Bertha may be as it recurves by the next several days. Bertha did strengthen last night and is a hurricane, 12 hours ahead of NHC's schedule. NHC has brought the top wind up to 75 mph as of 5 am edt. The lastest microwave estimates have it considerably stronger already. Just by looking at the visible satellite imagery, it looks like Bertha should be in the 80-85 mph range. There is a solid eye wall and cloud tops continue to grow. 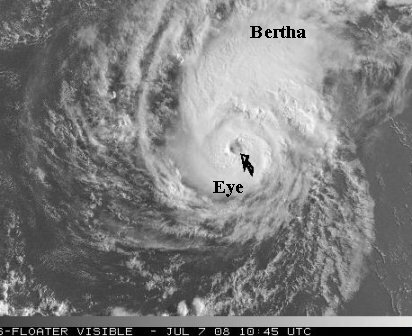 BTW, the Bertha of 1996 also became a hurricane on July 7. NHC increased the winds to 90 mph on the last advisory. It is probably stronger than that. Recent microwave estimates indicate over 90 knots. 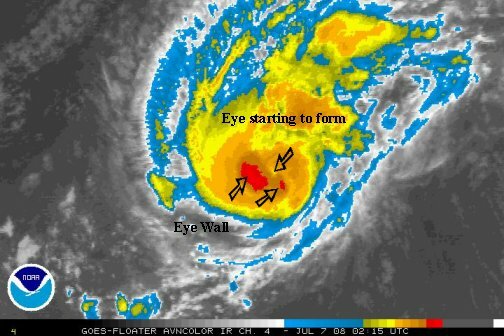 The eye wall presentation shows a complete and thick eye wall with cloud tops continuing to cool. More on the forecast tracks when the new models are in. Bertha is deepening rapidly. We're not sure how much NHC will pump up the winds at the 5 pm advisory, but it sure looks like it should be at least up to 105-110 mph. The eye wall has thickened. Too bad a recon wasn't there too give us the exact conditions. The forecast tracks of the most reliable models still turn Bertha east of Bermuda.